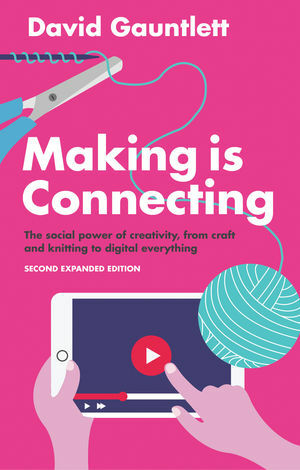 The first edition of Making is Connecting struck a chord with crafters, YouTubers, makers, music producers, artists and coders alike. David Gauntlett argues that through making things, people engage with the world and create connections with each other. Online and offline, we see that people want to make their mark, and to make connections. This shift from a ‘sit-back-and-be-told culture’ to a ‘making-and-doing culture’ means that a vast array of people are exchanging their own ideas, videos, and other creative material online, as well as engaging in real-world crafts, music projects, and hands-on experiences. Drawing on evidence from psychology, politics, philosophy, and economics, Gauntlett shows that this everyday creative engagement is necessary and essential for the happiness and survival of modern societies. This fully revised second edition includes many new sections as well as three brand new chapters on creative processes, do-it-yourself strategies, and platforms for creativity.